Ancient Egypt is among the most common slot themes, and Pyramid Quest for Immortality slot by NetEnt is one of the most popular and most commonly played slots. 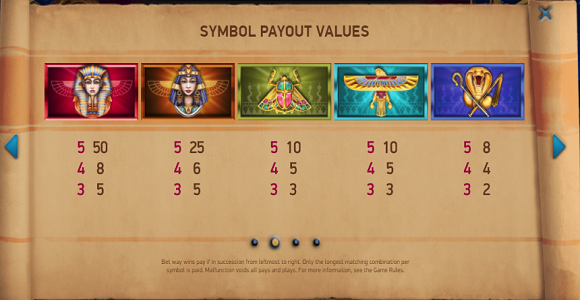 The game has an inventive layout where the number of symbols per reel aren’t the same for all reels and the Pyramid bonus features make the game even more exciting. With an RTP of 96.48%, Pyramid slot is definitely worth your time. If you want to know more about Pyramid, read our detailed Pyramid slot review and here we’ll tell you a bit more about the Pyramid bonus features. It is interesting to note that while there are no standard Pyramid bonus features such as Free Spins or other bonuses, the special Avalanche feature turns every win into a potential major win, so it plays the role of a bonus mode. The Avalanche multiplier activates automatically after a win payout. Another good thing about Pyramid slots is that a winning combination is formed whenever at least three symbols are aligned in adjacent reels starting from the leftmost towards the rightmost reel. So, if you want to activate the Pyramid bonus features you will need to win, and that isn’t too difficult due to the specific game layout. So, when a winning combination is formed, all winning symbols disappear from the reels. Even if a winning combination is formed with symbols on the first, second and the third reel and there is more than one symbol per reel, the additional symbols will also disappear. When the symbols disappear, new symbols drop on the reels, completely rearranging the symbols on the reels which can result with the creation of a new winning combination, and then the winning symbols will disappear again, and new ones will show up on the reels. With the Pyramid bonus features, aka the Avalanche, also comes a multiplier and the win multiplier is increased after three avalanches in a row and the maximum multiplier is ten times the winning amount which can give you some tremendous wins. Another great thing about the Avalanche feature are the wilds. Namely, if a symbol that is placed at the top position of the second, the third, or the fourth reel is part of a winning combination, a wild will appear in that position during the next spin, so if it happens that three symbols of the winning combination are in those positions, a minimum of three wilds will appear, not counting the additional wilds that might appear regularly. So, as you can see, even though there are no Pyramid bonus features in the strict sense of the word, the game offers a plenty of opportunities with its great Avalanche feature. Speaking of the Avalanche feature, there are few ultra-popular games that have the Avalanche feature, including the iconic Gonzo’s Quest slot. In Gonzo’s Quest, you can also activate bonus features after a win, in this case the bonus round is called Free Fall Bonus and in it you can get up to 10 free spins.